And so to my stash of patterns. I sat down just after I started this project and looked through my various beading books, bookmarking all of the beaded beads I thought would fit in. And my, there are a lot. And then I turned to my digital library of beading magazines, and remembered that Beadwork had done a series of Beaded Beads a couple of years back. I tried some of them at the time, but didn’t have quite the right beads in my stash, and have had more success this time. I’m not going to do the whole set of 5 (as this is a stash only project and I don’t think I’ve got all of the larger beads needed for some of them), but here’s the first one anyway. 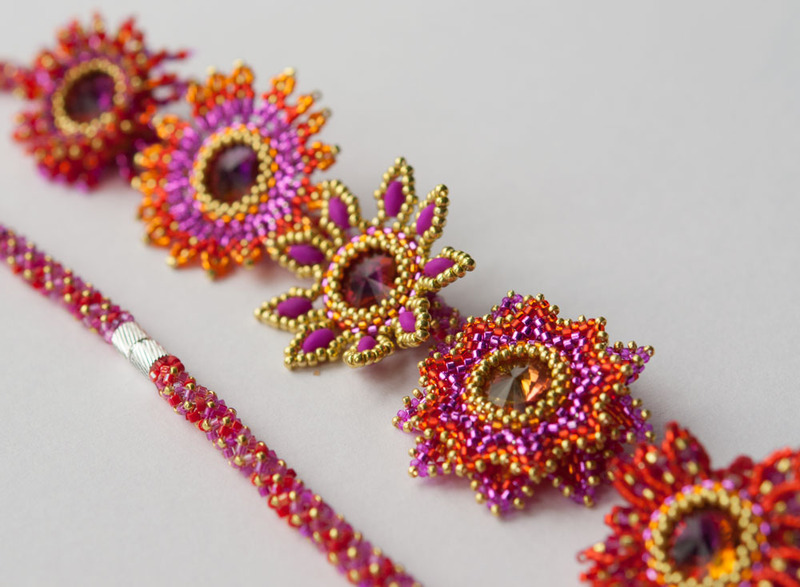 It’s from the April/May 2012 Beadwork Magazine, and is by Gwen Fisher – Cluster Beaded Bead. It’s a super one, goes together really nicely and quickly. I don’t tend to have many 8mm rounds knocking around though, so I will need to order some more if I want to repeat this one. None really, nice pattern, clear instructions. I mainly worked off the illustrations rather than the written out steps, which is normal for me, but the steps seem clear if you’re more comfortable with those. This has inspired and helped me with Beaded Bead 6, although I see now looking at the diagrams again that I used a significantly different thread path and set of steps for Bead 6, even though I thought I was doing something similar……….. The eagle eyed among you will have noticed that this isn’t exactly running in order – that’s because some of the beaded beads are easier to blog about than others. For example beads 4&5 are photographed, but I need to pull out the references and links needed to give the designers proper credit. Bead 6 is one of mine so less digging needed. Bead 6 is actually a set of samples which will hopefully evolve into a new tutorial – not quite there yet, as in samples 1 & 2 there’s a size 11 placement which annoys me, and the spikes in sample 3 are rather wobbly. But I will persevere. Sample 1 was born of beading lots of different beaded beads, and getting one of the possible structures so stuck into my brain that I had to try it in spikes. It uses 12 spikes, woven into a kind of a cube with trios at the corners. At least I think it is – looking at the finished ones I’m no longer sure (best take some step by step photos of sample 4). 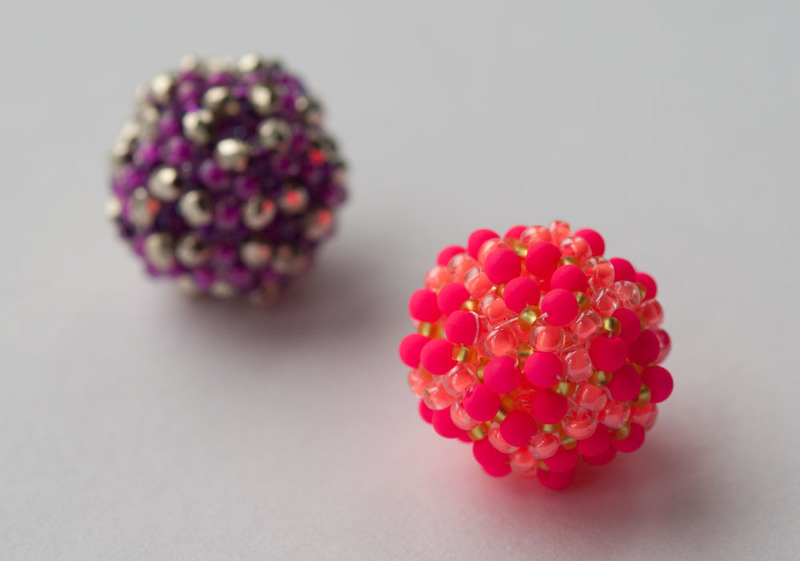 Sample 2 uses gumdrops (they are often interchangeable with standard size spikes as they have the same size base – 7mm). It switches to 11s from 15s in some places, but as you can see above still has 11s in the trios and they don’t sit right. And sample 3 is back to spikes to try and iron out some flaws in 1&2 by just using 15s. Still not right though, the spikes are more wobbly than 1. One more combination left to try I think…….. Anyway, no recipe yet or tips since you can’t try this one at home, but bear with me and it will emerge eventually as a tutorial. 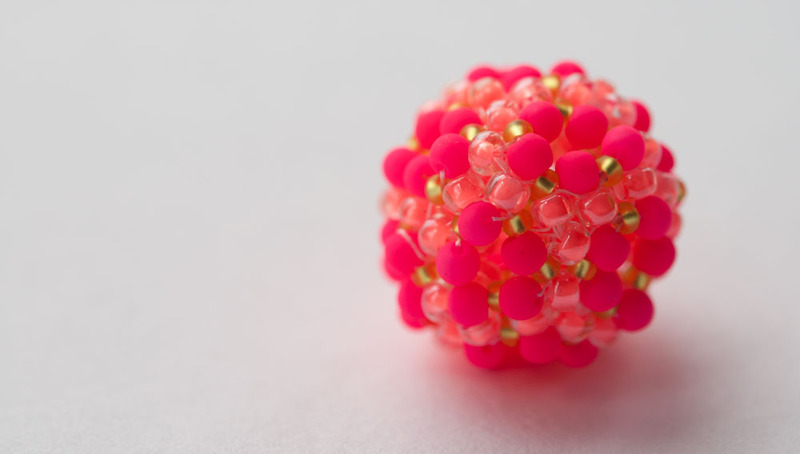 I think this is actually my favourite so far – simple, striking and a great way to understand the geometry of beaded beads. I used a free tutorial from Spirala Beading called Zuzana, and will be making more just as soon as I can get my grubby hands on some more pinch beads. A wooden core bead, I’d guess at 20mm but unfortunately didn’t measure it……sorry. If you have two colours, use them. If you don’t have two colours, wait until you do. Whilst it is possible to do this in one colour (I did), it is infinitely simpler if you can see the five beads which surround each 5 pointed star clearly. By all means switch to a single colour once you’ve had some practice – these are nice & quick to do so it won’t take you long to progress. Hold your nerve – it’s a bit of a floppy mess even with the core bead in, but the simple embellishment suggested pulled everything together perfectly. 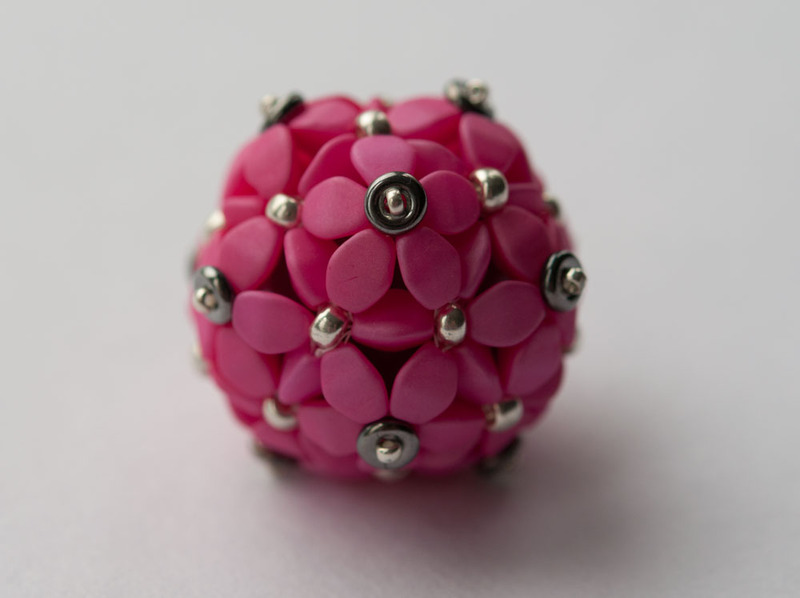 You may need to try a couple of different sizes of core bead. 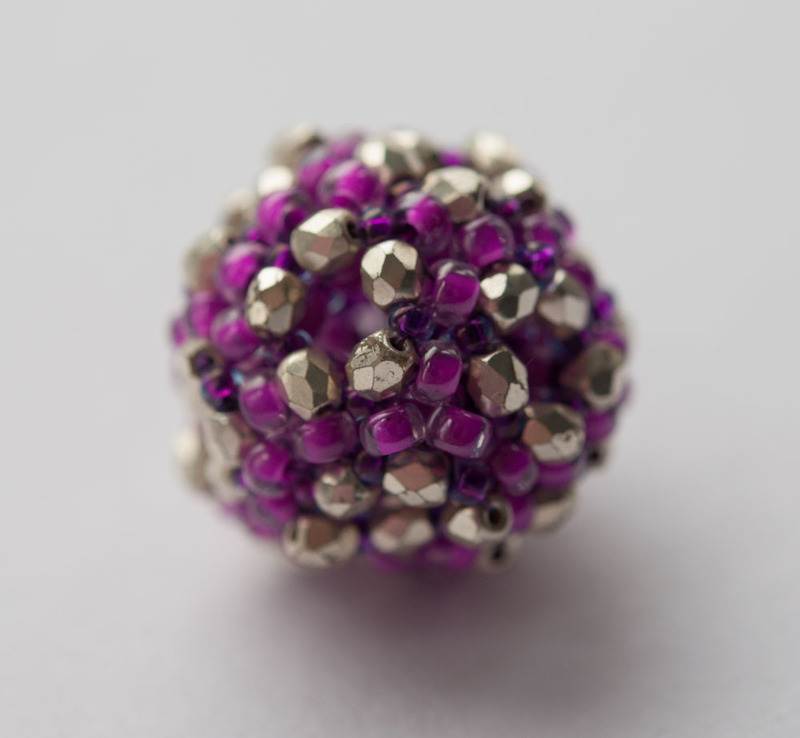 Once you’re done beading, roll the bead around between your hands a few times. This will make the trios of pinch beads which need to sit with a flat side against the core bead turn and lock into place, and is much easier than trying to force them round with a needle! 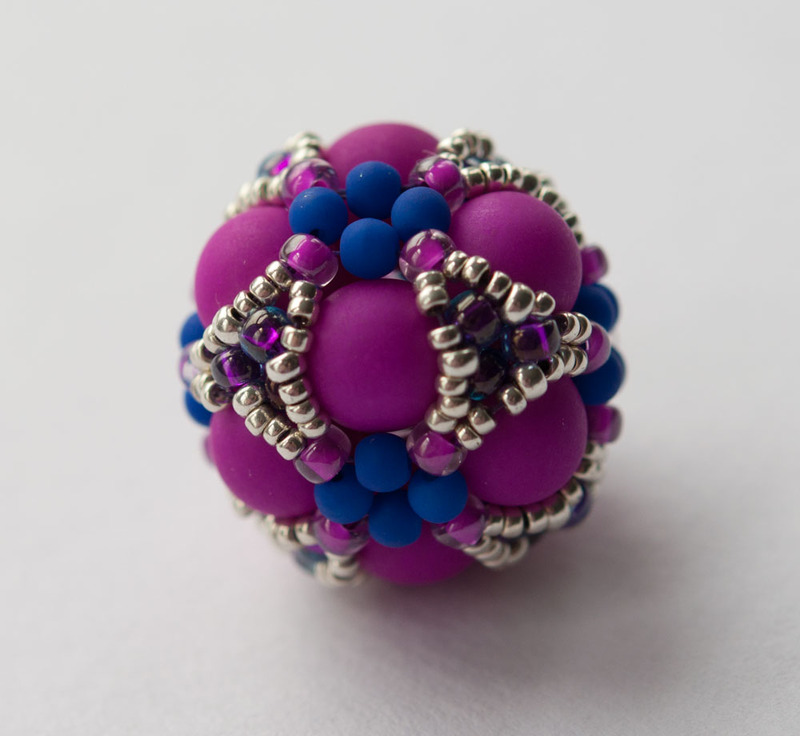 Now I just need an excuse to order some more pinch beads – and guess what, Ivona, who runs Spirala Beading also has a lovely Etsy shop selling lots of fantastic beads, including a huge range of pinch beads – Beads of Bohemia. What luck! Baroque Tape Measure – new Materials Packs at last….. So at last I have had time to photograph and list the Baroque Tape Measure Materials Packs which I worked so hard to put together a few weeks back. There are six new colourways, and I’ve re-shot the two I already had in stock as well. Altogether I have now made over twenty different colourways for the packs, and another five have been beaded into the original and my working samples. Perhaps not what I expected when I made the original piece for my Chatelaine two years ago. Author theindecisivebeaderPosted on August 15, 2015 Format ImageCategories BeadworkTags baroque tape measure, beading kit, instant download, kit, materials pack, tape measure, tutorial2 Comments on Baroque Tape Measure – new Materials Packs at last….. So, I finished my rope a little late (a couple of days), but then realised the catch I’d planned to use was too fat, and the components wouldn’t have slid on or off the rope over it. Given the way it was designed, I assume Jean means this to be an adaptable piece – wear one, three, all none of the bezelled rivolis as you please. For that to work the catch either has to be removable (which a simple s clasp with loops would b), or small enough that the components can slide. So, not the right clasp then. As we were away I had to wait until we returned to my stash to dig out a tiny magnetic clasp that will allow the components to slide on and off, and hey presto we’re done. Many thanks to Jean for a lovely project and for the phenomenal amount of admin she’s had to put in as a victim of her own success. And to all the beaders worldwide, it’s been fab – let’s hope someone is brave enough to do this next year!